Spend Matters welcomes this guest post from Corrina Hutchings, market analyst at Mintec. The cashew nut is increasing in popularity as research continues to show the health benefits for consuming them – as long as they are not salted or honey roasted! Raw cashews will not only improve the taste of your curries or stir-fries, but will add extra protein and rich nutrients, which are good for your heart, eyes and skin. Compared with other nuts, cashews, like almonds, have low calories per nut. However, before you rush out to stock up, bear in mind cashews are still relatively high in calories compared with other food and you will only need a few. The recent increase in prices, which are up 23% since the start of the year, may also put you off. The market is currently experiencing the highest price in nearly five years, due to low supply from the major growing regions, particularly Vietnam and West Africa. The combination of severe droughts and heavy rains in these areas saw a reduction in both crop yields and quality earlier in the year. Vietnam is the largest producer of cashew nuts — responsible for 28% of world production. However, Vietnam also imports shelled cashews, which are processed at large plants in the country and re-exported. Consequently Vietnam accounts for 42% of the world’s processed cashew nut exports. Many of the cashew nuts imported by Vietnam originate from West Africa, which is still experiencing severe droughts that could also affect next year’s crop. Demand has also increased from buyers looking to Vietnam, due to the high quality of their processing. Despite the high prices, exports from the country are currently up 5% at 228,000 tonnes since the start of 2016 when compared to the same period in 2015. Concerns over the quality of the upcoming crops also means buyers are rushing to secure current supplies. With cashew prices reaching such a high, you may be better placed looking at the alternative healthier nut: the almond. Previously high almond prices saw the popularity of the cashew nut increase. For nearly two and half years, almonds traded at a premium to the cashew; however, prices are now lower. Almond production in California for 2015/16 is estimated to have reached 1.9 billion pounds, due to severe droughts. Weather conditions for the 2016/17 season, however, have been more favorable. In addition, an increase in planting area is expected to see the production rise to 2.1 billion pounds. 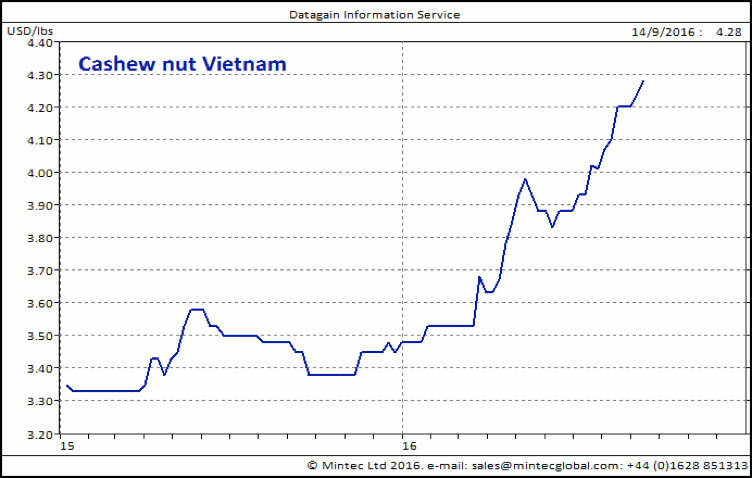 If you’d like to learn more about recent price movements across the nut market, you can do so in our October Commodity Report, released on the Mintec e-store at the end of October. Lentil Prices Plummeted in Recent Months, but will it Last?